As we enter February, we are reminded about the “Holiday of Love” just around the corner! In true DCF fashion- we’ve planned something sweet for the holiday! Our “HEART- BREAKER” will be available in very limited quantities up until Valentines Day. The Heart Breaker consists of a large pure Belgian Chocolate heart-with special colour and texture. Inside the heart you’ll find a wide range of sweet treats, including chocolate heart truffles, chocolate buttons, chocolate crispy pearls, sprinkles, and of course cinnamon hearts. 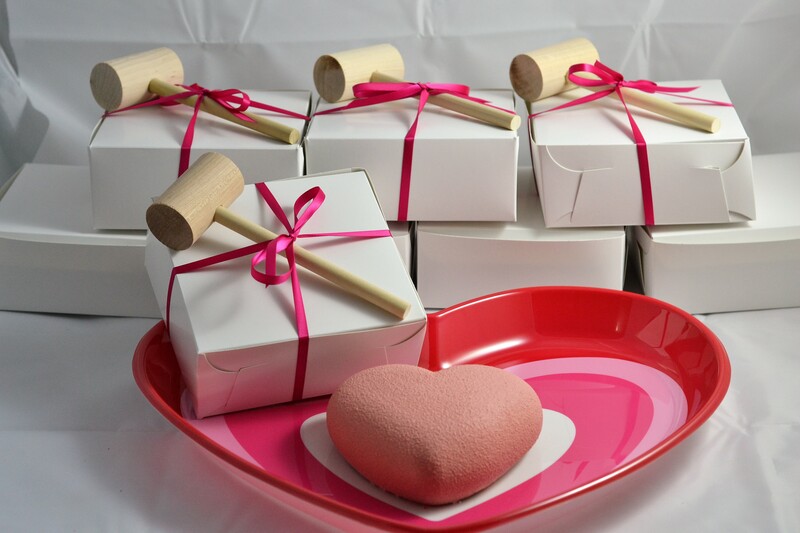 Each Heart Breaker is individually packaged in its own box, and comes with its own wooden mallet (for a smashing good time)!! See below for some pictures and the Heart Breaker in action!! The Heart Breaker after meeting its mallet! Here’s a video of the Heart Breaker in action!!! Contact us for more details! We’d love to tell you more about this amazing dessert!! !